Propane is a safe and reliable fuel source. Like many other fuels, however, it is flammable and should be handled properly. An odorant is added to propane gas that is distinctive and has been described as smelling similarly to "rotten eggs." If you ever smell gas or have any safety concerns, please contact your local Blue Ridge Energy office immediately. Get everyone outside and away from the home or building. Call your propane supplier (use a neighbor's phone if propane smell inside the house). Stay outside and leave the gas off until assistance arrives. For more detailed information on propane safety please view these safety modules provided by the Propane Education and Research Council. Propane is transported and stored as a very cold liquid. It can cause a "freeze burn" or frostbite if it contacts the skin. Propane will not ignite when combined with air unless the source of ignition reaches 920°F. However, propane is flammable when mixed with air (oxygen) and can be ignited by many sources, including open flames, smoking materials, electrical sparks, and static electricity. The odorized propane smells like rotten eggs, a skunk's spray, or a dead animal. Some people may have difficulty smelling propane. For example, some older people have a less sensitive send of smell. Certain medical conditions or the effects of medication, alcohol, tobacco, or drugs can make it more difficult to smell propane. Immediately put our all smoking materials and other open flames. Do not operate lights, appliances, telephones, or cell phones. Flames or sparks from these sources can trigger an explosion or a fire. From a neighbor's home or other nearby building away from the gas leak, call your propane retailer right away. If you can't reach your propane retailer, call 911 or your local fire department. ...until your propane retailer, emergency responder, or a qualified service technician determines that it is safe to do so. 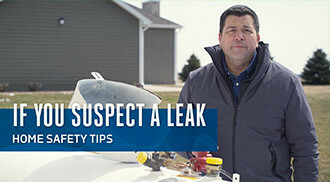 Before you attempt to use any of your propane appliances, your propane retailer or a qualified service technician must check your entire system to ensure that is leak-free. Carbon monoxide can also enter a home if an appliance venting system or chimney becomes blocked (for example, by a bird's nest). High levels of carbon monoxide can cause flu-like symptoms, such as a headache, dizziness, fatigue, shortness of breath, nausea. 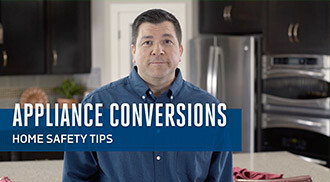 If you expect carbon monoxide is present, ACT IMMEDIATELY! If it is safe to do, open windows to allow entry of fresh air, and turn off any appliances you suspect may be releasing the carbon monoxide. Never use a portable heater indoors, unless they are designed and approved for indoor use. Be sure to follow the manufacturer's instructions regarding installation, location, and maintenance. Appliances without a pilot light often have an electronic ignition instead. If you do run out of gas, A LEAK CHECK IS REQUIRED. In many states, a propane retailer or qualified service technician must perform a leak check of your propane system before turning the gas back on. Set up regular delivery to ensure that you have enough gas. Be prepared if a major storm is approaching. Make sure you have an adequate supply of propane in your tank if a major storm is predicted your area. Space heaters can be dangerous if used improperly. ALWAYS follow grill manufacturer's instructions and keep written materials accessible. NEVER store or place a propane cylinder in an area of excessive heat (120 degrees or higher) or near a stove, fireplace, or other heat sources. The heat builds up pressure inside the cylinder, which may cause the pressure relief valve to release propane. Flash fires or explosions can result from exposing cylinders to heat. 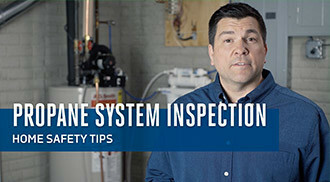 It is important to inspect your cylinder and outdoor gas appliances for leaks. Do this before using them for the first time each session as well as on a regular basis. This can be accomplished with a simple "bubble" test. Make sure your cylinder is equipped with an overfill prevention device (OPD). 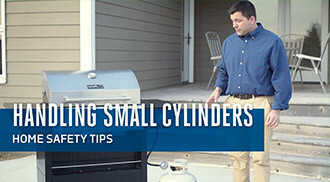 An OPD is a safety feature that helps prevent small propane cylinders from being overfilled. Most cylinders with OPDs have special triangular handwheels with the letters "OPD" on them. If you are uncertain as to whether your cylinder has an OPD valve on it, ask your propane retailer. DONT RISK IT! Call your propane retailer or a qualified service technician for assistance. Know what propane smells like. It has a strong, unpleasant smell like rotten eggs, a skunk' spray, or a dead animal. Know how and where to turn off the propane. This includes your outdoor tank and your appliances inside. For help, contact your propane provider. During an extended power outage, you may choose to use a portable generator. NEVER use a portable generator indoors or in an enclosed area such as a basement, garage, shed, or tent. This can result in carbon monoxide poisoning or death. NEVER use a gas oven or ranch-top burners to provide space heating. Know what propane smells like. It has a strong, unpleasant smell like rotten eggs, a skunk's spray, or a dead animal. Use caution when returning to your home or farm. Check for downed trees or power lines that can create safety hazards. Report any problem immediately. DO NOT enter and buildings on your property unless it is safe to do so. If it is dark, use flashlights, not candles. Floods can move, shift, or damage gas lines, tanks, and equipment. If you find a propane tank on your property that is not yours - or if your propane tank is dislodged or missing - call your propane company or fire department immediately. If a hurricane approaches, you could be in danger. Listen to a local television or radio station for information and instructions. If a storm threatens your safety, special actions may be necessary. Listen to local authorities, or television and radio stations for information and instructions. If your power goes out, additional care is needed to keep safe. Mark your propane tank location with a flag, pole, or stake that is higher than the average snow cover depth for your area. Make sure you have an adequate supply of propane in your tank. In the event of a storm, roads leading to your home might not be accessible for delivery. If a winter storm threatens your safety, you may hve to decide whether or not to leave your home. Listen to a local television or radio station for information and instructions. Clear snow and ice from around your propane tank. If pipes freeze and crack, gas can leak out and create a potential danger. Clear snow and ice away from all outdoor vents, chimneys, and flues. Whenever possible, use a brrom instead of a shovel so you won't damage your propane system. NEVER store, place, or usage a propane cylinder indoors or in an enclosed area such as a basement, garage, shed, or tent. Clear heavy snow and ice from regulators, regulator vents, piping, tubing, and valves. Appliance vents, chimneys, and flues must be kept clear of snow and ice so appliances can vent properly. Extremely cold temperatures can cause pipes to freeze or crack. 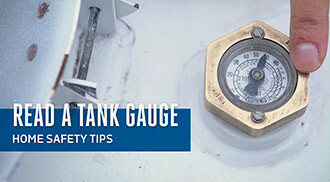 High winds or falling ice can move, shift, or damage gas lines, tanks, and equipment. 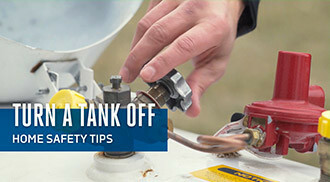 If you suspect any of your propane appliances, equipment or vehicles have been damaged, or you have turned off your gas supply, DO NOT use until a service technician indicates it is safe. If a wildfire approaches, you could be in danger. Listen to a local television or radio station to find out if you must leave your home or farm.